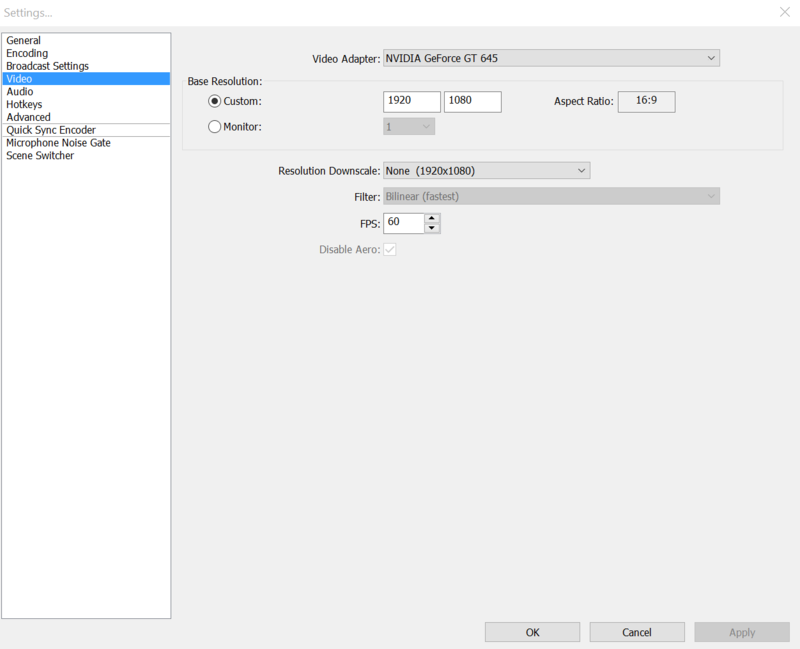 Here are the settings you are required to change to get high quality local recordings (using the x264 encoder). Do not attempt to use these settings for live streaming! Where X is anywhere from 1-20, lower being higher quality / higher CPU usage. A good place to start is the 15 - 20 range. A CRF of 0 enables lossless recording which will have very high file size and CPU requirements and introduces compatibility issues, so be careful! Setting the buffer size to zero disables the VBV system, allowing x264 to hit any bitrate necessary to achieve the quality (CRF) specified. If you wish to increase quality further, you need to use advanced options - quality 10 is equal to a CRF of 22, which is fine for live streams but not so good for local recording. For compatibility with various editing software, it's also recommended to enable CFR (advanced options) and do not use CRF 0. CRF 0 uses "High 444" mode which a lot of editing software (and some video players) cannot handle. For best results, set your output file format in broadcast settings to FLV. You can convert it to MP4 afterwards if you need to. Recording directly to MP4 is very risky, as if OBS or your PC crashes, the whole recording is useless. FLV on the other hand will keep everything up until the crash. 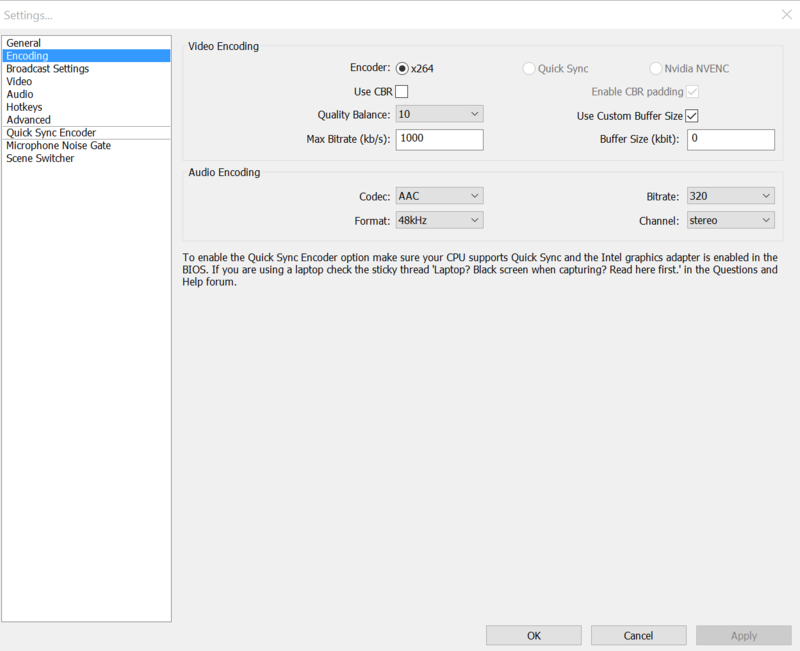 If you use QuickSync, NVenc or AMD VCE as your encoder, these settings will not work. Can you make an updated version for version 19.0.2? with ur help I have made a version for me and hopefully too all of you who got the problem of blackscreen because off Custom x264 Encoder Settings in advanced, it might only be me cause of my 5 years old computer but if not, here u go! This is mostly for youtubers but read all () if you are a streamer - hope this is a good setup for you like it is for me! Take custom and set it too ur computer screen size, most common is 1920x1080 - if you don't know, go to display settings on ur computer and find out. Skip audio as it's all up too you there, we don't have same headset and taste her im sure. Same with hotkeys, skip too advanced. that's it, ignore the rest under, if you're a streamer u should research up the 2 under urself, not really needed though, u can do fine without them, but they can help u be more proffessional. Hey R1ch, I just built my new PC in December and I'm looking to make some higher quality videos and I've been tweaking the settings with OBS for a bit now with little luck. The first part of The Evil Within I recorded looked somewhat choppy and kept getting pixelated. That being said, I stumble across this post and this was probably the best thing I've ever found because my quality improved tenfold by using the aforementioned settings! Thank you so much for sharing friend, you are amazing! =) Time to slaughter some games in high quality! Thanks, but the FPS falls a lot.